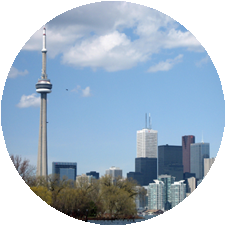 Toronto, Ontario in Canada is a part of the Logistics Plus® network. This office provides LTL and truckload brokerage, air and ocean freight forwarding, warehousing and distribution, project cargo, import/export, and global trade compliance services. It is located in Southern Ontario on the northwestern shore of Lake Ontario, with the original city area lying between the Don and Humber rivers. The ports of Toronto and Montreal are frequently used as a gateway to entry in the U.S. market, and Toronto is located just 2 hours away from the U.S. border via truck. The North American Free Trade Agreement (NAFTA) makes trade between Canada, the U.S. and Mexico particularly attractive. The Logistics Plus office in Cambridge is where we proudly serve both small and large businesses throughout the Greater Toronto Area (GTA). Our office is in proximity to the Port of Toronto, which makes it an excellent location for shipments entering and exiting Canada though the St Lawrence River and Lake Ontario. If you’re located in Toronto, or any other surrounding community, your friends at Logistics Plus are ready to provide you with local, domestic, and global transportation and logistics services. Additionally, we’ll show you how our people in Canada put the “plus” in Logistics Plus by doing the big things properly, and the countless little things, that together ensure complete customer satisfaction and success!